I returned to my house project this afternoon. Time flew, and I found that I hadn't gotten as far as I might have expected for the length of time I was there in the Studio. A lot of that is because I did quite a bit of erasing and redrawing in some areas, sometimes with nothing to show for the effort. Some changes stuck around until the end of the session- an improved computer monitor on the desk by the stairs, some furniture seen through the door in the lower right corner, and more specific architecture and objects on the top floor. I can't say for sure that all of today's additions will stay as they are now, but they fit in with plans for the image. 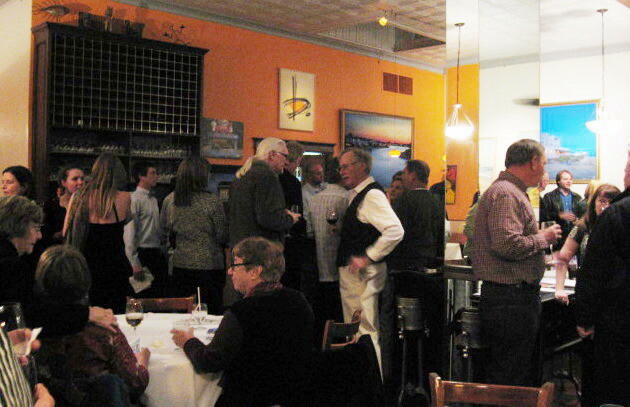 This evening I went to Brandl, a restaurant in downtown Belmar, for something called a "Belmar Art Party". 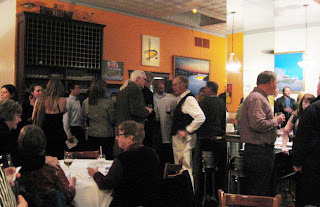 This invitation only event was put together by the Belmar Tourism Commission, for the purpose of launching the 2012 edition of Belmar Magazine, an entertainment and tourism publication. I wasn't sure what it had to do with art, but the restaurant is known for good food and is normally priced well beyond my budget, so it seemed like a good opportunity. If there's one thing all artists have, it's an instinct to seek out free hors d'oeuvres and turn them into dinner. Sure enough, I had my fill of kobe beef sliders, mini crab cakes, and crispy veggie spring rolls, while taking care of some BAC related art business. This included possible new plans for last year's mud mural at the Boatworks, and laying the groundwork for another round of woodcut classes in Belmar. Details will follow in each case when I know something. A few days ago I had some time to kill between classes. Lucky for me I had stashed my new house block in my bookbag. Having thought about it for a few days, I decided to go ahead and put in railings around all stairs and walkways. 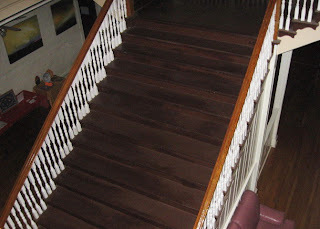 As much as I didn't like that it would obscure some of the piled up stuff in my house, I decided that having no railings or bannisters might cause some viewers to concentrate more on the extremely dangerous nature of the house and less on the intended theme. 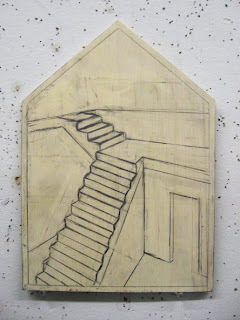 As a bonus, I think the spindles hide a few of the flaws in the architectural drawing. The results of those efforts can be seen above. Today I had time to go into the Studio and work on it some more. I made a few adjustments to the perspective, based on further observations from my second floor perch. 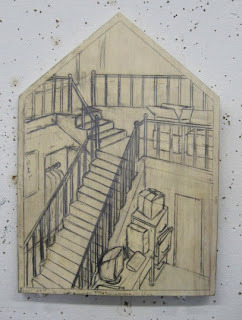 Most of the time was spent sketching potential clutter for the house- first on paper, then on the block. 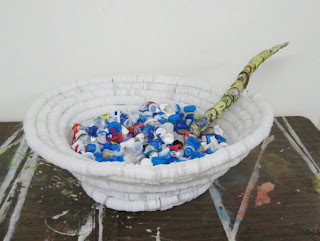 At the end of the day's session, I had done what is shown above, all of it things I have moved from one house to another, or disposed of through trash or the recycling center. On the far side of the main staircase I put in an open closet revealing hanging clothes. Next to it, a frame on the wall, to filled with some artwork later. On the near side of the staircase, a filing cabinet with a drawer bursting with papers. Next to the cabinet, a desk with a somewhat out of date computer. Up on the first landing, some generic cardboard boxes. There's a good chance that I will have to redraw a lot of the individual objects, but I think the idea works. Next time I'll consider what's seen through the door on the lower level, and start adding stuff at the top level. Still working my way through the first week of the spring semester, but all the classes are locked in and all my copies are made, so I could afford to devote some time to art today. It's been almost two weeks since I surfaced my house shaped block, and though I hadn't touched it since, I've given a lot of thought to the project. 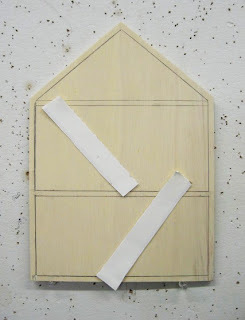 Other than the general theme of "house", artists are allowed to do anything they want with these blocks. The promotional material did mention the current housing crisis as an optional topic, but the possibility of a lot of people doing that is a good reason to do something else. So I decided to go with an idea that hits closer to home, literally. Over the past year, every member of my immediate family has been involved in moving, one way or another. My brother got married and moved in with his new wife. I moved into a new apartment, and my parents are moving down into the area as part of their retirement. One thing we've all had in common is finding that we have way too much stuff to fit into our respective new homes. Downsizing has been the buzzword in the family. Through a combination of garage sales, charity donations, recycling, curbside abandonments (intact furniture or significant metal objects left out overnight will usually be snatched up by somebody), and garbage pick-up, we are all making progress. Based on numerous cable tv shows about hoarders, pickers, pawnshops, and storage unit speculators, having too much stuff is an American epidemic. 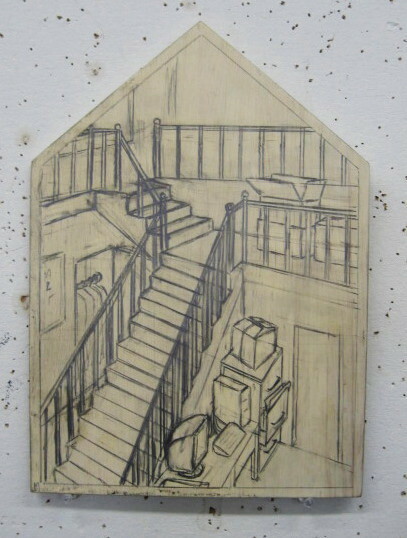 So my piece is going to be an interior view of a house with too much stuff, along with efforts to empty it. The stuff will be the kinds of things I've spent the past 6 months moving from one place to another. Lots of boxes, furniture, clothes, books, papers, etc. I expect to have a few figures in there as well, generic humans hauling items around. My first concept was to divide the block into 3 layers, a cross section of a house with two floors and an attic level, connected by stairs. The photo above shows an early state, the paper strips representing possible locations for stairways. However, I decided that it wouldn't work at this scale- each floor would give me 4 inches or less of vertical space, and the accumulated stuff would have to be too small to recognizable. Plus the simple box like structure was kind of dull. I still liked the idea of multiple levels, and a connecting stairway, so I took a walk upstairs to the second floor of the Studio building. The late 19th century school building has some pretty cool architecture, including this stairway that connects the first and second floor. The view above is looking down over the 2nd floor railing. I brought my block up there and did some very rough sketching. 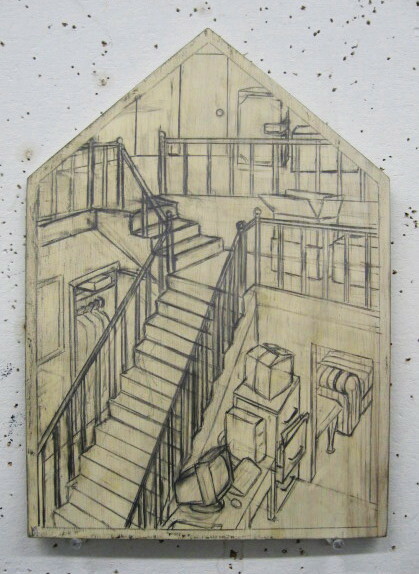 Back downstairs in the Studio I cleaned it up and did the detailed sketch seen below. The orignal staircase has a wide central stairway, and at a landing near the top splits into steps to the right and left continuing to the second floor. I changed the stairs to the right to a large landing, and indicated some possible first floor architecture. The perspective needs a lot of adjusting- I don't mind if it's a bit skewed, but I'd like it be more consistent. Logically I should put in the various railings and banisters, though it would obscure some of the spaces where I plan to show stacked up stuff. 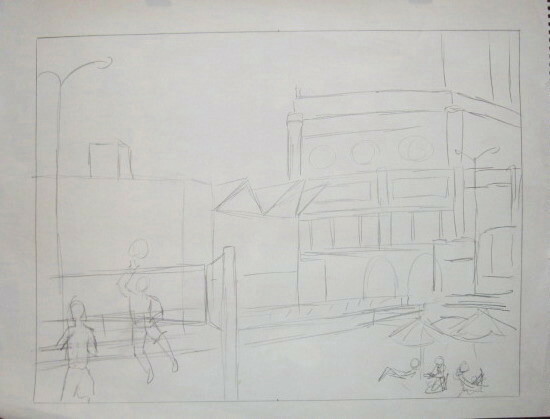 But I think the general composition is good, so my plan right now is to fix the perspective and then go from there. Been busy getting ready for the spring semester, so I haven't had a chance to work on any ongoing projects this week, but I figured I could spare a few evening hours to draw. Just a few Wednesdays ago I mentioned that the weather had turned cold enough that the model asked us to raise the heat in the room. So we were a little surprised tonight when well into the first pose, she asked if we could lower the heat. Sure, those spotlights can be warm, but this is the middle of January. If she could take it, we could, and the thermostat was nudged down a little. My first drawing of the night is best left unseen. 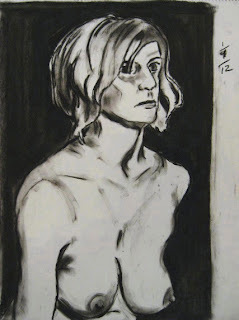 The second one, a 30 minute drawing shown above, was definitely the better of the two. Sometimes I do better when I have to work more quickly, or maybe I finally got warmed up myself. Although I've spent some time over the past few weeks preparing to start a new boardwalk print, a different piece will likely be the next thing that I finish. 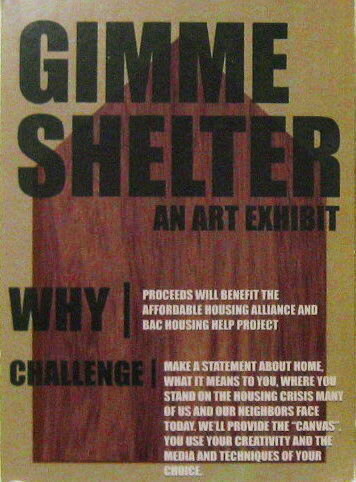 The Belmar Arts Council is organizing a fundraising exhibition called Gimme Shelter, which will benefit the Affordable Housing Alliance and the BAC Housing Help Project. 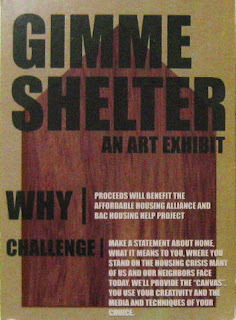 Participating artists get a 5 sided piece of lauan plywood, to be used in the creation of an artwork that addresses the theme of home in some way. 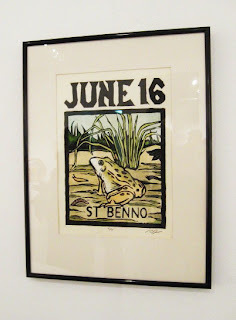 Most will probably paint on it (the prospectus repeatedly refers to it as a "canvas"), but it can be used in a sculpture, and the website shows an example (from a similar exhibition elsewhere) of it used as a woodcut block. All the details about the project can be found over on the BAC website. Since I have the experience of carving several hundred pieces of lauan, it's a pretty sure bet that I'll be doing that again here. 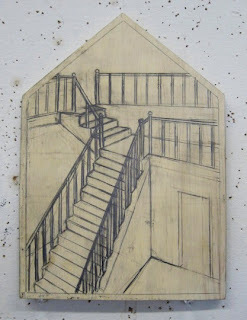 What remains to be determined is whether I will be exhibiting the carved block or a print pulled from that block. I'm leaning toward the former, which would probably fit in better among the many painted versions that will likely fill the gallery. I will take prints off the block no matter what and I'll make the final decision after I see both. I'm still working on the idea for my piece, but meanwhile I got the first step out of the way. 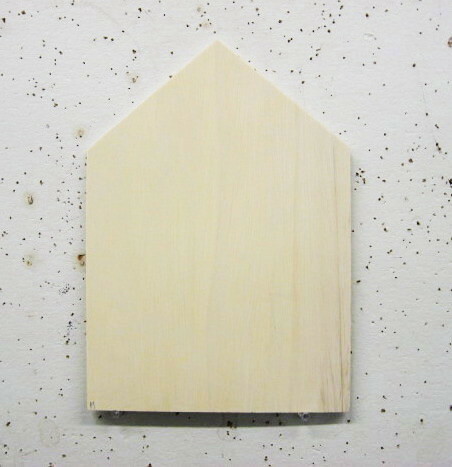 It was already a relatively smooth piece of wood, but I decided to go ahead and do my usual surfacing with wood filler. Above and below are before and after, which I admit don't look too different from each other. But it will be easier to draw on when I'm ready to start drawing. Went to the Belmar Arts Council twice today. 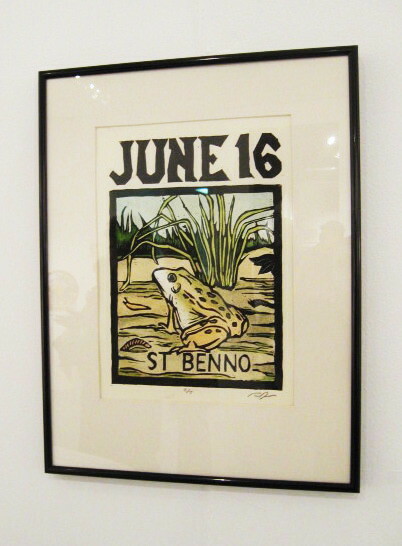 On the day I dropped off my piece I had signed up for a gallery sitting shift for this afternoon. But when I got there I was told that the sign up sheets had been prepared in error, and that the show wouldn't be ready until tonight's Salon event, so I would not be needed. Came back after dinner for the Salon event, where all the participating artists are invited to present their work to the assembled crowd, talking about what, why, and how, and taking questions. My piece (shown above) was hanging by the door and assigned #1 on the list, and it was decided that I'd go first. I gave people the quick version of the idea behind the whole series, and read the piece of the paragraph from Benno's entry in Butler's that inspired the print. We had 38 works in the front room, and 26 of the artists showed up to participate. Limiting each to 2 to 3 minutes (much shorter than our Studio critiques, but many more people), we got out at a reasonable hour. I learned from my father yesterday of the passing of a former neighbor of ours, Lee White. The viewing was today, in a funeral home that I used to walk past on my way home from school. I knew Mr White from his heavy involvement in Boy Scouts, where he was active with local troops, the council, and with the whole national organization. It seemed like he knew everything that was taught in scouting- once he taught me the whole morse code alphabet in about 15 minutes. (I've forgotten most of it since) His regular job was his business designing displays for advertising and exhibits, which were constructed from corrugated cardboard. The two came together (for me) in 1985 when I was on his staff for the National Scout Jamboree at Fort AP Hill in Virginia, just a few months before I'd be moving to the state to begin college. Along with some other scout leaders and some older scouts from around the country, our job was to build and run a recreation area for our section of the Jamboree grounds, and he shared some of his expertise with corrugated cardboard so we could construct signs and decorations. Ten years later I'm finishing my third college degree and starting to get work into exhibitions in places far enough away that I need to ship them. Some might just get a generic box, throw in the art along with a pile of styrofoam peanuts and send it on its way, but not me. Using my memories of corrugated construction, I'd get a flat sheet of cardboard, cut it and score it, fold and secure it with paper tape (part of my kit since etching classes) and have myself a strong, safe, and reusable container custom designed to hold my framed artwork. 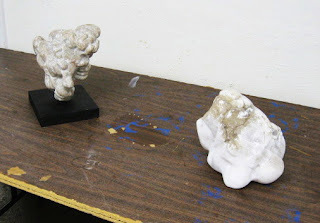 (by the way, gallery directors hate styrofoam peanuts- static makes them stick to everything and you can never repack the artwork for return shipping) Some of my boxes have made multiple trips across country, and I've never had a piece damaged yet. Doesn't have to be a flat sheet- I can take any large cardboard box (love appliance shipping containers- really strong cardboard) and recut it to whatever dimensions I need it to be. 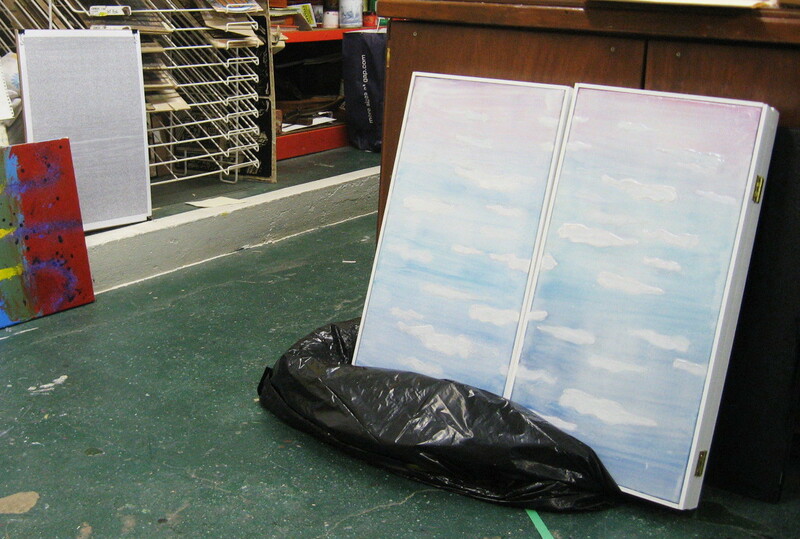 A few years ago I had a major show in Iowa and spent the better part of a month making shipping boxes. I don't love making boxes- I'd rather be drawing or cutting- but I'm glad that I can do it when I need one. And I owe that skill with cardboard to Lee White. After a planned one week delay to move out of the shadow of New Year's Day, tonight we held the first critique group of 2012. Twelve artists showed work, and no one cried. I guess that's why Bravo doesn't give us a television show of our own. Most of the work can be seen on the main wall above. At ground level from left to right: a watercolor from Harriet, a graphite drawing in progress from Katie, an oil painting from Tim, prints and printing plates from Mary, a mixed media sculpture by Edy, and a painting from TJ. On the wall above those: mixed media pieces from Molly, a completed graphite drawing from Katie, a small watercolor from Molly, and my just completed pencil sketch. (click the photo to enlarge). 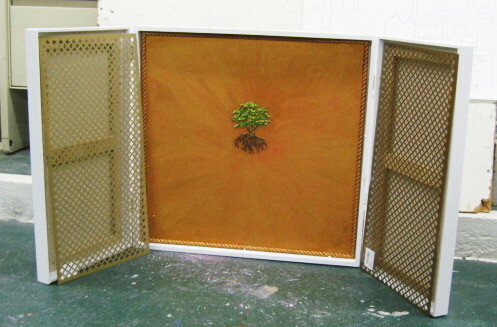 A little later we looked at two more, a digitally derived image from Vince (above, far left) and Sheilagh's diptych (above right), now reconfigured with hinges to form a triptych when opened. 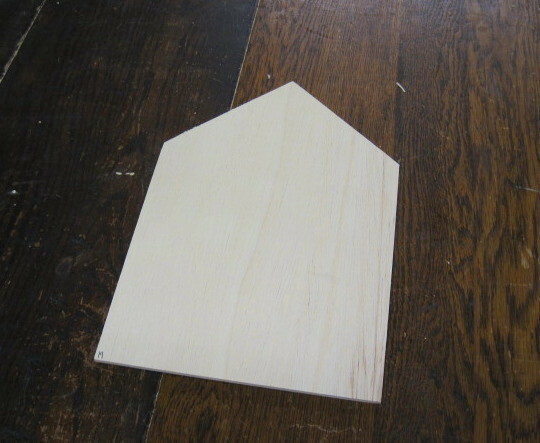 Below is the opened piece, so we could see the work in progress. After that we moved to our annex (the cafeteria) to see the last two artists. Lisa's construction (above) this time was intended to be a cereal bowl, though she was admitted the results looked more like a basket. Jane brought two pieces of alabaster, leftovers from a class she teaches. Both are in progress. 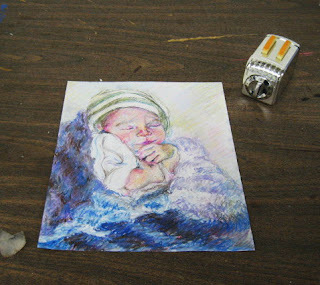 She also brought in the pastel drawing below, part of a never ending series of family portraits. When it was my turn, I passed around the little linoleum print I made for the upcoming workshop (my most recently completed artwork) and presented my very preliminary version of the next boardwalk print, executed moments earlier. It got some interesting reactions. This may have been the first time I showed such an early state of one of these boardwalk prints, and so some wondered how the composition would be affected by the eventual dividing lines of the diptych format. I explained that I would work out what would be in each half at a later stage in the process. There was a request for a more prominent position for the former Howard Johnson's (triangular windows/roof near the center), as an iconic Asbury location. I'd think that Convention Hall would have that effect, but I'll consider the suggestion. In a carefully worded suggestion, Molly wondered if any of the people in the print would be gay. Not a completely random question- over the past few decades Asbury Park has become as known for its large gay community as much as anything else (something that I'm sure many residents prefer to other associations like drugs, gangs, economic ruin and decay, political corruption, etc), which figures heavily in local arts and businesses. Relatively recent New Jerseyan Molly is most familiar with this version of Asbury, but I guess my associations are older, more Springsteen related- his time and song subjects, and it hadn't even occurred to me. I'm not sure how it would even be relevant, as I expect that most of the figures will be small and crowded and relatively indistinguishable. For what it's worth, that photo show I saw in Asbury a few days ago was full of images from the boardwalk, but mostly empty buildings lacking people of any particular orientation. I'm still a long ways away from worrying about any individual figures in the print, so I can consider the matter later. I can always seek out reference photos on the web, but I prefer to take my own or sketch from life when possible, so for that reason it makes more sense to start the daytime scene now and deal with the rides in the spring. Wanting to have something to show tonight, just before leaving for the Studio, I pulled up some of my weekend photos from Asbury on my computer, and did some very simple sketches of general architecture in a sketchbook. Molly was already at the Studio when I arrived, and as others walked in I chose one of the views from my sketchbook, and in about 5 minutes did the sketch below at the full 15" x 20" size of the boardwalk prints, throwing in a few sample figures. None of this is final, and it's not to scale or in proportion. I just wanted a basic visual as I discussed the idea with the critique group. Normally I'd wait until I'm further along in the process to post something here, but since I showed it to the public tonight, I'll post it. For the reaction, see the post about the critique. Just a few days ago, we had single digit wind chills around here, and I found myself shivering on short walks from my car to whatever destination I was heading to. Today, we got back up into the 60's, a situation that must be taken advantage of when it comes around in early January. Took care of many unrelated errands, but got in some art stuff, too. In the morning I framed a piece to submit for the upcoming annual BAC Members' Salon. 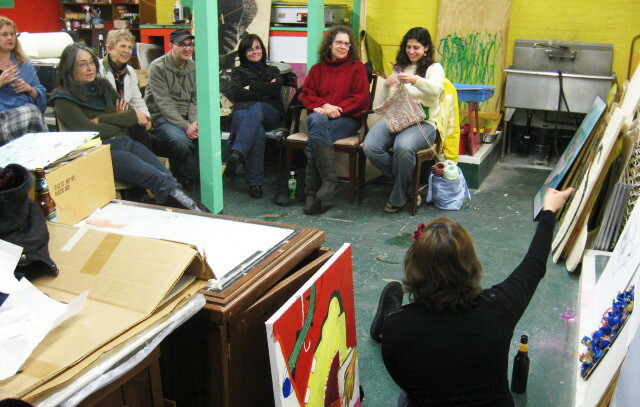 Despite years of effort, the BAC has never been able to get the same kind of popularity for its critique group as the one that meets in my Studio. 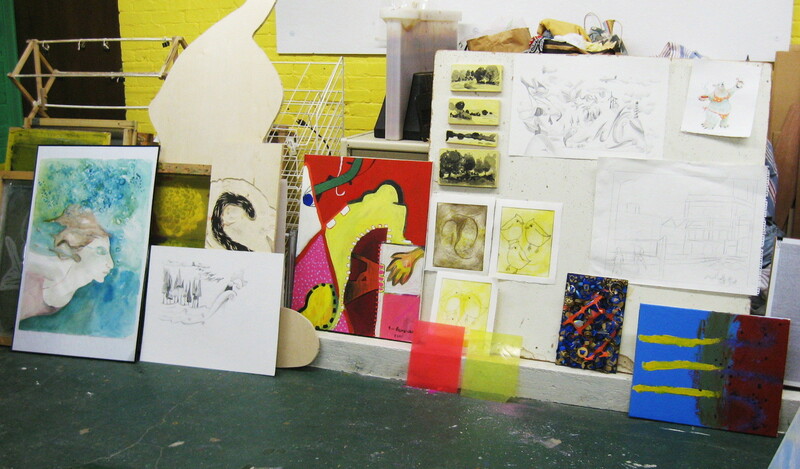 However, allow people to put the work up on the walls for a few weeks of exhibition, and they'll come out in droves. By the end of today's intake, about 3 dozen artists had brought work in. It will get hung early in the week and on Thursday night we'll have the Salon- every artist who shows up will have the opportunity to present their work and take comments and questions- basically a critique group. I don't want to waste a major work in a minor show like this, so I decided to submit the St Benno print that I just finished last month. I could have swapped it out with another saint in a frame, but I decided to borrow a slightly larger frame, but with a window mat cut to similar proportions. After three other stops, I dropped by the Boatworks and dropped it off. Didn't bother to take photos of the framing process, but I'll post photos of the framed piece when I shoot the show next week. From there I drove to the Studio. I can't finish my ongoing boardwalk print series if I don't get started on the remaining prints, so today was devoted to getting something going. I brought some of my notebooks and collected reference clippings of the past few years, to see what developed. Of the planned themes from my original list, the next likely one will either be a general daytime scene or boardwalk amusement rides. For the latter I will need to do a bit of on site research, but to get going on the first I just need a good background setting to build around. Although I have generally avoided using real locations for most of these prints so far, I have considered using some of Asbury Park's iconic structures as background. On one hand, there are people who are predisposed to buying artwork that features Asbury's famous structures, and plenty of local places that like to feature it. On the other hand, Asbury's boardwalk area buildings are pretty much an art cliche around here, and I'd be adding my print to that huge pile. But while I considered that, I figured I may as well use the beautiful day to collect some references. So I walked up Main to the ocean, turned north, and walked through the remains of the Casino and onto Asbury's boardwalk. I continued walking until I reached Convention Hall, at the northern end of the built up boardwalk area. I hiked out over the sand to down near the water's edge and took some shots looking back toward the boardwalk, such as the one above. From there I walked back through Asbury toward Main, alongside the lake. I detoured to Cookman Ave to check out a gallery opening. A photography gallery has moved to a new larger space in its same building, and tonight was the debut. Between the permanent and portable walls, there were maybe a couple of hundred photos on display...and the majority of them were photos of Asbury's landmarks in various states of decay. On the first Saturday of the month, Asbury galleries will often have coordinated receptions, but after checking out a few other spaces on the street I found nothing new, so I walked back to my car in Ocean Grove and drove home. Around this time last year we were still digging ourselves out from the biggest snow storm in recent memory, and with the temperatures rarely getting above freezing for weeks at a time, that snow stayed around for quite a while. By comparison, this year the weather has been pretty mild. Instead of looking at 4 foot high piles of snow and ice, several of the days in the holiday week reached into the 50's. The months that closed out the year were pretty much the same way. However, some true winter weather showed up the past few days. No precipitation, but some bitter cold temperatures. It was only recently that one of the models at drawing night had requested that we turn on the air conditioner; the hot lights shining on her more than made up for her lack of clothing. Not tonight. I had turned the heat up before we started tonight, but halfway through the evening she requested that we raise it again. For the moment anyway, winter is here. 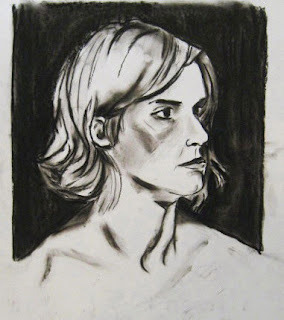 Our model was in one pose for the whole night, but I can't work two hours on a single charcoal drawing, so I drew her from two different sides of the room. For the first drawing I had a profile view with her face mostly in shadow. During the break she agreed that it looked more like her than most of my drawings of her, though (we did not discuss) I felt that the body proportions could have been better. For the second drawing I set up on the other side of the room, right next to a freestanding spotlight that had her completely lit from my point of view. Hardly any of the shadows that are normally a big part of my portrait pieces. The only true darks were all around her- the unlit purple and black stage area behind her. As a result, surface modeling (see above) is more subtle than my usual drawing style (though still a little darker than in reality). Never got the model's opinion on this 45 minute drawing, and the face doesn't look particularly like hers, but my fellow artists really liked the 2nd drawing, so I decided to post this one tonight.